Two wildlife experts gave short presentations. Kent Hall provided insight on birds and Dr. Liz Fakazis on bees, including the importance of nature and poetic potential. Attendees were encouraged to jot down phrases and ideas to use as part of a group poem later in the day. WFOP's own BJ Best shared selections from his Birds of Wisconsin poetry collection and talked about assembling a themed manuscript. After creating and sharing group poems, a panel consisting of WFOP's Karla Huston, Steve Tomasko and Marilyn Taylor shared one of each of their poems and talked about using "the birds and bees" in poetry to enlighten and entertain rather than to shock and offend. Afterwards they answered audience questions. In between rounds of Friday night's open mic Jeff Ross performed an interactive presentation. 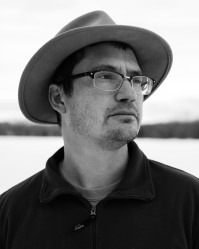 BJ Best is the author of three books of poetry Birds of Wisconsin (New Rivers Press, 2010), But our Princess is in Another Castle (Rose Metal Press, 2103), and State Sonnets (sunnyoutside, 2009). He's published several chapbooks, most recently Yes (Parallel Press, 2014). Best also writes children's nonfiction and flash fiction. He holds an MFA from Washington University in St. Louis and is an Associate Professor of English at Carroll University in Waukesha. He lives in West Bend with his wife, son, and the occasional salamander in the basement. Dr. Liz Fakazis is professor of Media Studies at UW-Stevens Point. She has a BA in Biology, a BA in English Literature, an MA in Journalism from the University of Missouri, and a PhD in Journalism from Indiana University. Dr. Fakazis has a strong interest in the importance of bees in American society. In 2014 she organized "Beyond the Hive," an event held at UWSP that related art, photography, films and food with performances and lectures. Dr. Fakazis got hooked on bees after visiting with UW-Madison bee expert Claudio Gratten. Kent Hall is Emeritus Professor of Biology at UW-Stevens Point where he taught for 30 years before retiring in 1998. He has a major interest in birds and their biggest threat global warming. Active in the Aldo Leopold Society for fifteen years, he has developed and coordinated the Audubon Bluebird Trail (ABT) in Central Wisconsin, which has grown during the past three years into the largest and most productive bluebird trail in North America with 1,380 boxes in seven counties. Since its inception, the ABT has produced 74,000 songbirds, 57,000 of which were bluebirds. No wonder he carries the moniker "The Bird Man of Central Wisconsin." Jeff Ross is a recent graduate of UW-Stevens Point and lives in Weston with his wife and two boys. He is an avid bicyclist and camper. He is recently "famous" for his PowerPoint presentation "Bee Private Eye" at Schmeekle Reserve Center in Stevens Point last year. While working on this he discovered there was much more to bees than collapsed hives and honey. Ross hopes to expose people to the much larger world of bees and the larger-yet world of nature.